Pegram & Noyes Insurance Agency in Gastonia, NC has been proudly serving the greater Gastonia NC area since 1998. We are an independent agency – representing A+ rated carriers for all lines of insurance coverage throughout North Carolina and South Carolina including auto, home, motorcycle and business. Our commitment and attention to detail ensures each and every individual, family, and business receives the coverage, service, and support they deserve. Call us at (704) 823-9495, request a quote or stop by our office and start saving today. When you work with Pegram & Noyes, you choose to work with someone who takes time to understand your coverage needs and budget. We have specialists in auto, home, motorcycle, boat and commercial insurance, ensuring that you receive high-quality advice, valuable guidance and customer service. If you are ready to learn more about your coverage options with us, please do not hesitate to call or request a quote. One of our experienced agents will promptly get back to you. We look forward to working with you. 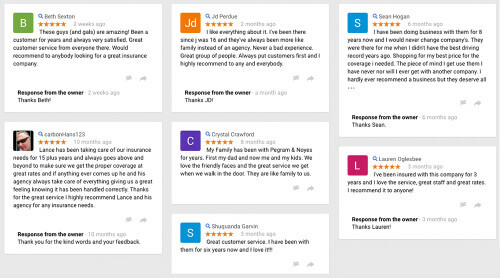 At Pegram & Noyes, customer service and satisfaction is our number one priority. A caring, customer focused and detailed approach are just a few reasons why customers feel confident enough to give us a unanimous five star rating. There is always a friendly voice on the other end of the line or warm greeting when visit our office. We believe each and every customer experience is crucial to building a lasting and trusted relationship.